For the running back, see Larry Morris (American football running back). Morris was a four-year starter and a two-way player at center and linebacker positions for the Georgia Tech Yellow Jackets. Morris was also selected as three times first-team All-SEC and a team captain as a senior. He was a standout player during coach Bobby Dodd's most successful seasons at Georgia Tech. The Jackets had a 40-5-2 record over Morris’ four seasons, won two SEC titles, four bowl games and a share of the 1952 national championship with a 12-0 record. He may have played his best performance in his final game as a Yellow Jacket against rival Georgia in Athens on November 27, 1954. He played the entire game and was credited with 24 tackles as Tech beat the Bulldogs 7-3. He was later named to the All-SEC 25-year team spanning 1950–1974 and in 1992 was inducted into the College Football Hall of Fame, one of 12 Tech players to be enshrined. Morris was the seventh overall pick of the 1955 NFL draft. He enjoyed a successful NFL career and was named one of the linebackers on the NFL 1960s All-Decade Team. Morris played 12 seasons total with the Los Angeles Rams, Chicago Bears, and Atlanta Falcons. 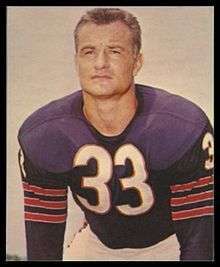 He was the MVP of the 1963 NFL Championship Game for the Bears. In addition, he was a member of the Atlanta Falcons' first team in 1966. Morris was featured in an article in The Sporting News about former football players who suffer from head injuries that happened during their career. According to the article, Morris had little, if any, recollection of his playing days. Morris died on December 19, 2012 from complications of dementia. ↑ Ken Sugiura (2012-12-21). "Tech Legend Larry Morris dies". ajc.com. Retrieved 2012-12-22. ↑ "The Greatest 25 Tech Athletes Of The Century – Nomination Bios". ramblinwreck.com. Retrieved 2012-12-23. ↑ Ralph Ellis and Hunt Archbold (2012-12-21). "Georgia Tech Football Great Larry Morris Dies". midtown.patch.com. Retrieved 2012-12-22. ↑ Matt Crossman (2011-07-11). "John Mackey and other retired NFL players experience living hell". sportingnews.com. Retrieved 2012-12-22. ↑ Mayer, Larry (2012-12-21). "Defense gearing up to face rookie QB". Chicago Bears. Retrieved 2012-12-21.